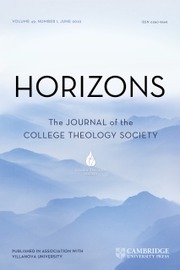 Horizons publishes award-winning peer-reviewed articles, roundtables, and book reviews across a wide range of topics in theology and religious studies. While rooted in a commitment to the long and deep Catholic tradition of "faith seeking understanding," that commitment also welcomes all original scholarship in theology and religious studies that contributes to its basic constructive focus. It is unique in content with its ecumenical view, wide range of methods and topics, and insightful analysis of belief interacting with culture. Horizons publishes work by college and university professors with both active research profiles and teaching experience. The early centuries in the history of Christian asceticism, and of monasticism that it gave rise to, invite a short and accessible overview. Theology and Spirituality: Strangers, Rivals, or Partners?